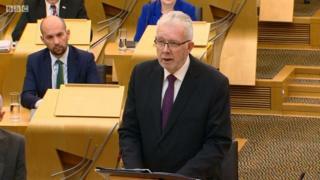 Image caption Mike Russell told MSPs that leaving the EU without a deal would "result in chaos"
Leaving the EU without a deal would "result in chaos" despite work which has been done to prepare, Scottish Brexit minister Mike Russell has said. Michel Barnier, the EU's chief Brexit negotiator, said on Monday that there could be an agreement on the terms of the UK's exit by early November, if both sides were "realistic". However, on the same day, Brexiteer MPs warned Prime Minister Theresa May that they were not prepared to back her plans. MPs and MSPs have returned from the summer recess to a pivotal moment in the Brexit process, as Mrs May attempts to sell her vision of Brexit to both European leaders and her own Conservative Party. Former Brexit minister Steve Baker told the BBC on Monday that up to 80 Eurosceptic MPs were ready to rebel against the prime minister's plans, warning of a "catastrophic split" in the party. Downing Street contends that its Chequers plan is the "only one on the table" which can deliver Brexit while avoiding a hard border on the island of Ireland. However, Mr Russell told MSPs that there was not a straightforward choice between Mrs May's plans and no deal at all, calling the former "unpractical and unworkable" and the latter "impossible and unthinkable". He said: "The Tories want to force people to choose between the disaster of a hard Brexit outside the single market and the catastrophe of a no-deal Brexit. "That is an utterly false choice - and no one should be fooled into thinking that that makes Chequers in any way acceptable. "We will continue to make the case, vigorously, for membership of the European single market - which is around eight times bigger than the UK market alone - and customs union." Mr Russell urged the Conservatives to "rule out a no-deal outcome immediately", but added that the Scottish government was doing "the responsible thing by making sure we have plans in place just in case we face that worst case scenario". He added: "However carefully we prepare for a no deal scenario, it will still result in chaos." The Scottish Conservatives said the speech was "empty posturing" in light of Mr Barnier's latest comments. Constitution spokesman Adam Tomkins said: "Mr Russell was desperate to be the herald of doom, but he is contradicted by Michel Barnier, who has said that it is perfectly possible to reach a deal on Brexit within the next six-to-eight weeks. "This is good news, but the SNP doesn't want to hear it, because everything it says on Brexit is negative. The only thing being stockpiled here is ministerial grievance and tired political cliché." Labour's Neil Findlay said a no-deal Brexit would be a "disaster" and said his party opposed the "cobbled together" Chequers plan. He also voiced "serious concern" with the planning the Scottish government has done, saying there was "little in the way of practical detail". This was echoed by Green MSP Patrick Harvie, who said he wanted more "reassuring information" about the "potential chaos" of a no-deal Brexit - leading Mr Russell to reply that realistically, minsters "cannot mitigate every outcome of no-deal". And Scottish Lib Dem leader Willie Rennie agreed that pitting Chequers against no-deal was a "false choice", but urged Mr Russell to "get off the fence" and back a referendum on the final terms of Brexit.